Ibrahim serves as the dedicated Muslim chaplain at the Canary Wharf Multifaith Chaplaincy. In his role, he supports the broader Chaplaincy team offering pastoral care to Muslim professionals working on the Canary Wharf estate. Ibrahim has been involved in chaplaincy and the training of Muslim chaplains for more than 10 years. In addition to his work with professionals on the Canary Wharf Estate, Ibrahim is the student mentor and chaplain to the Cambridge Muslim College and the Ebrahim College in East London. 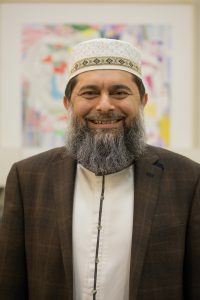 He volunteers his time serving as a community imam in Leicester and sits on the University of Leicester’s World Faiths Advisory Group. Ibrahim was born in Malawi to Indian parents and migrated to the UK in 1984. He is married with four sons. Ibrahim completed his seminary studies in 1990 and has been involved in religious service ever since. He is a national council member of the Muslim Council of Britain, co-chair of the Christian Muslim Forum and a member of Religions for Peace UK and the European Council of Religious Leaders. Ibrahim has contributed to GCSE Religious Studies text books and regularly delivers lectures in the UK and abroad. In his spare time Ibrahim enjoys watching sports – particularly football, cricket, boxing and Formula 1 racing. He also enjoys DIY and keeps tropical fish.